With own stage and music, custom voice lines. The Witcher hisself, Geralt of Rivia, is joining the playable character roster of Soulcalibur VI, Bandai Namco has announced. 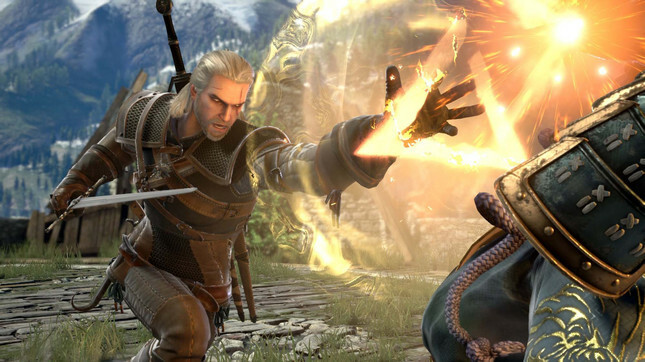 When Soulcalibur VI launches later this year, it will mark the first time Geralt has appeared in a game outside the esteemed RPG franchise that is The Witcher. "Geralt was trained at the elite School of the Wolf and is considered one of the deadliest monster slayers," said Bandai. "He possesses superhuman reflexes and strength, as well as superior sword fighting skills." His signature fighting style – a combination of swordplay, ability-enhancing potions, and combat magic – will be present in Soulcalibur, and so will lines from his English voice actor Doug Cockle, and "Hunt or be Hunted" from The Witcher 3: Wild Hunt soundtrack. He will even get his own stage: Kaer Morhen, home keep of the School of the Wolf. "When we were approached with the idea of doing a crossover, we thought our community would really enjoy playing as the witcher,” said CD Projekt RED community lead Marcin Momot. "We’ve collaborated with Bandai Namco artists to faithfully recreate Geralt, and shared original Witcher 3 assets like Geralt’s model, animations, and weapons. "I think Bandai Namco did an outstanding job of capturing all the details and introducing The Witcher to Soulcalibur in a way fans of both series will enjoy." Soulcalibur VI's roster will include returning characters like Mitsurugi Sophitia, Kilik, Nightmare, and Ivy, as well as some other newcomers.